The European Commission has adopted the new European Interoperability Framework (EIF) which will help European public administrations to coordinate their digitisation efforts when delivering public services. An official presentation of the framework has been made, at the Digital Day in Rome, together with other initiatives that aim to promote cooperation between EU Member States to better prepare society to reap the full potential of the digital transformation. Many EU Member States are digitising their public administrations to save time, reduce costs, increase transparency, and improve the quality of services that they offer to citizens and businesses. Doing this in a coordinated way ensures that the public sector is not only digital but also interoperable. The EU framework published today will help Member States to follow a common approach when making their public services available online, also across countries and policy areas. This will contribute to reducing bureaucracy for people and businesses, for example, when requesting certificates, enrolling to services, or handing in tax declarations. 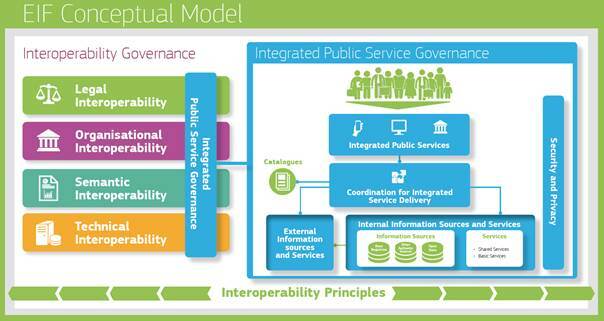 The framework, which has been developed under the ISA² programme of the European Commission, includes a set of 47 concrete recommendations that can help public administrations to increase their interoperability. The application of the framework by European public administrations will ensure that their services are standardised, automated, streamlined and provided securely in less time and with less effort.